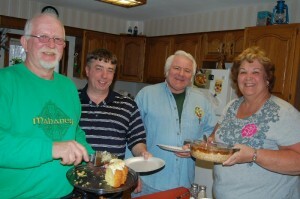 HANNIBAL, NY – The Hannibal Democratic Committee’s annual chicken barbecue will be held on May 5. Preparing for the upcoming chicken barbecue in Hannibal are from left: Dan Mahaney, Town Highway Superintendent; Adam Labanoski; Gordon Prosser, committee chair; Karen White. It will be at the Hannibal American Legion on Rochester Street. The barbecue will run from noon until 3 p.m. or until the chicken is gone. The $8 price includes a half chicken, salt potatoes, baked beans, macaroni salad, dessert and beverage. Take outs are also available. Advance sale tickets are available and recommended. For information or tickets call: 564-5658 or 564-5630.